A blog for book artists and their lovers. Great news west coast book artists! The College Book Arts Association has decided to host its upcoming 2012 conference in our own backyard. This is actually great news for all of us, as it's a conference worth traveling to. Here you'll meet book artists from across the nation as well as international visiting artists. A series of brief lightning talks on this year's topic of "Time, Sequence and Technology" will see both talented students (such as yours truly) and celebrated book artihttp://www.blogger.com/img/blank.gifsts share their thoughts and inspirations. Round table discussions, divided into three groups: graduates, curators, and educators, will invite viewers to share their book-arts related questions with participants. The first day of these discussions will be hosted on Mills College campus in Oakland, CA; the second day, at The Hilton in Emeryville. Also: key note speaker Buzz Spector will allow you the opportunity to meet and get to http://www.blogger.com/img/blank.gifsee live and in the flesh Buzz Spector! For those hands-on types looking to learn something new, a series of demonstrations from Secret Belgian Binding to Cyanotype Printing will also be held in coordination with the conference. Should you want to take some new work home for yourself, the CBAA will host its first ever live auction. Lastly, but not least(ly? ), a juried exhibition of members' work will be held January 5 - March 11th on the sixth floor of the San Francisco Public Library. 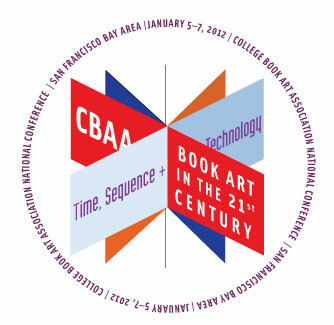 Save the date and register here: http://www.collegebookart.org/cbaa_meetings_conferences!